When starting out in business, it helps if you’re offering a product that people already need or want. If your passion is in dance and fitness, you can rest assured that the demand is still huge. If there was any reason to suspect that the enthusiasm for all things dance was on the wane, then the incredible popularity of PSY’s Gangnam Style has surely ended the discussion. Not only was the K-Pop hit the most viewed YouTube video in 2012, it was also the second most popular search phrase of that year (according to Google’s Zeitgeist feature). In terms of hot markets, dance fitness and early years dance are two of the liveliest trends of recent years, and with the addition of Street Fit Kids®, we are in a great position to offer you a real opportunity to enhance your lifestyle. And the best news is that there are just a few tweaks you need to make to start turning a hobby into a career. Many of the changes you will need to make will be subtle and psychological – like learning how to organise your paperwork and being savvy with your money. Nevertheless, there is no getting around the fact that you will also have to invest some of your hard-earned cash to get going. We sincerely believe that the £285 we charge for our one-day Street Fit Dance Instructor Course is about as low-cost as you get for a serious business opportunity – certainly far less than the dance franchises that are out there (anything from £8,000 to £25000 according to Startups.co.uk). Even if you are already a dance teacher but are not convinced that street dance is a genre you would be comfortable with, it is still worth considering adding it to your toolbox. 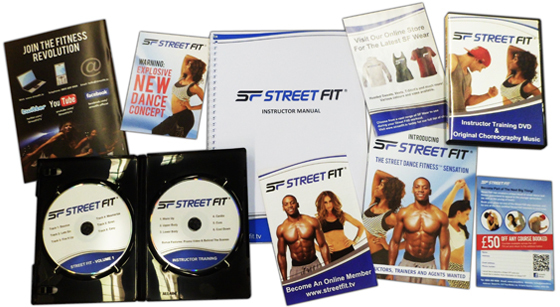 By becoming a Street Fit® member, you can also enjoy the luxury of regularly updated choreography, saving you the time and effort of creating your own from scratch. If you do catch the Street Fit® bug, you could always hire freelance dance instructors to take over your other classes! The location you choose to set up in will have a huge bearing on your success. While that may seem like a common-sense statement, it is surprisingly easy to get carried away with assumptions only to find out that the demand isn’t there. It may seem strange to set up near another dance school (or facility offering dance classes), but the extra competition is balanced by the fact that you will know from the outset that there is an active market. Your task then is to show everyone that you offer something different. That’s where the benefit of the Street Fit® name and distinctive branding comes into play. Street Fit® Instructors do have rules to follow (like following the workout structure safely and abiding by the branding regulations), but compared to a franchise, you are refreshingly free to run your classes as you see fit. But if you do want that little bit of extra support, Street Fit® Membership is available as an affordable add-on giving you access to additional resources, training, marketing templates, peer support and all of those other things that make your journey that little bit smoother. Is it time you made the most of your passion for dance? Sign up to one of the eLearning packages. http://www.streetfit.tv/wp-content/uploads/2012/11/Hero-Image-1.jpg 237 700 admin http://www.streetfit.tv/wp-content/uploads/2014/07/StreetFit.png admin2013-01-31 09:31:062018-09-16 14:06:48Could You Turn a Hobby into a Career? With Street Fit You Can! Don’t get us wrong; we admire those tough cookies still out there in their tracksuits and trainers, braving the ice and snow to maintain their New Year’s fitness resolutions. We just prefer to exercise in more temperate surroundings. The cold snap can be a blessing in disguise for Street Fit Instructors, with people shunning the great outdoors and opting to fulfil their fitness pledges in the warmth and relative comfort of a gym or sports hall. For anyone looking to drop a dress size or two, or bulk up those biceps, Street Fit® offers a results-driven solution that helps you to keep those important pledges. The rationale is simple: if you begin to see real results from your exercise programme, you will feel more motivated to keep working at it. The added bonus with the Street Fit® Hip Hop Workout® is that as your weight (and waistline) drops, your strength, poise, balance and self-confidence will rise, leaving you feeling wonderful. So the next time you feel like doing a bit of cardio training in the winter, instead of pounding the frozen roads come in from the cold and join a Street Fit® class for some fun, calorie-consuming dance fitness. If there are no Street Fit Instructors in your area, then think seriously about joining us and becoming the face of Street Fit® in your neighbourhood. If one of your promises for 2013 is to improve your social life (and we all need the support of other like-minded people sometimes), then Street Fit® can fill that hole too. Our day-long Street Fit Instructors ’Course brings together people from all walks of life who share a passion for dance and fitness. Everyone who comes along is made to feel part of our ever-expanding family. If you’ve made a promise to yourself to overhaul your life completely in 2013, then Street Fit® could just be your ticket to success. If you think your options are being underpaid and undervalued on one hand, or unemployed on the other then maybe there’s another way. Have you ever heard the phrase, ‘the best hope for business is the business of hope’? Well that sentiment can be brought down and applied to any fledgling business. Basically, if you have a positive attitude and work hard, the rest will follow suit.